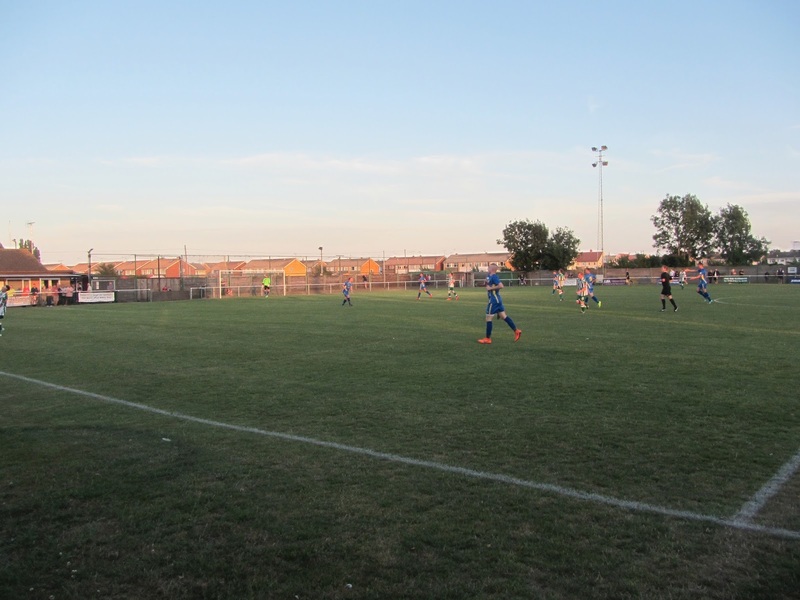 My tenth ground of 2015 was on Tuesday 21st July at Burroughs Park in Great Wakering, Essex. 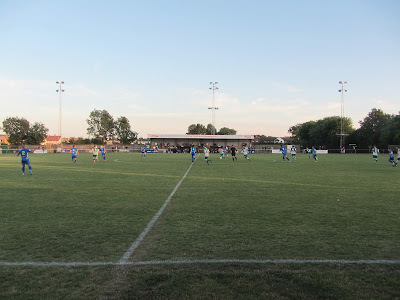 The match was Great Wakering Rovers vs. Concord Rangers in a friendly. Burroughs Park is adjacent to a large number of allotments on the edge of the village of Great Wakering. 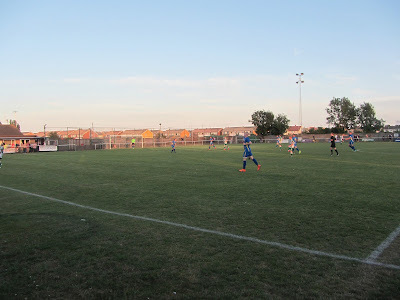 Is is 2.5 miles from the nearest railway station at Shoeburyness although Southend Central at 5 miles away has the advantage of connecting bus services. The venue has been home to the club since 1985. 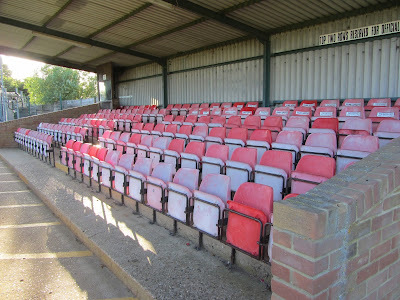 The ground has one all-seater stand which sits just to the west of the half-way line on the northern side of the venue. This stand can hold 150 supporters and includes a wooden press box in the back corner. The remainder of this side of Burroughs Park is uncovered hard standing and there is a small demountable club shop just to the east of the all-seater stand. The southern side has a covered terrace level with the half-way line. In front of this are the two dugouts. There is additional uncovered concrete terracing behind both of the goals with this taking up half the space at the eastern and western sections of the ground. The north-east corner, known as Nobby's End, contains the clubhouse, a food outlet and changing rooms with a roof section extending over the hard standing in this corner. The game was a friendly between Isthmian League Division One North side Great Wakering Rovers and Conference South side Concord Rangers. 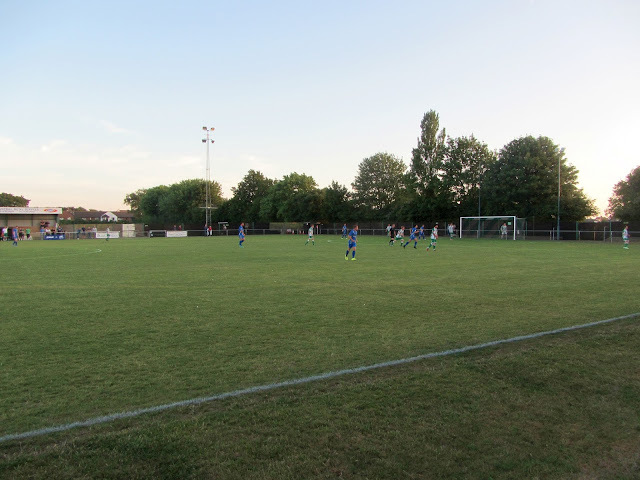 The visitors were the better of the two sides throughout the game taking the lead in the 23rd minute as Ben Greenhalgh dinked a free-kick over the wall and into the bottom corner from 20 yards. Five minutes later Concord doubled their lead with a short corner routine allowing Sam Bantick to collect the ball before cutting inside a defender and curling the ball past the keeper. The home side steadied themselves and had a decent spell before the break including an effort which hit the crossbar. However the away side showed their two division advantage in the second period with a comfortable performance. Great Wakering relied on their goalkeeper to make a number of good saves but in the 82nd minute they broke through when Tony Stokes held off the attentions of the home defence before curling into the net from the edge of the area. Concord rounded off the scoring in the 87th minute as they camped around the home penalty area - the first couple of shots were blocked but when the ball fell to George Doyle he made no mistake as he slotted home.